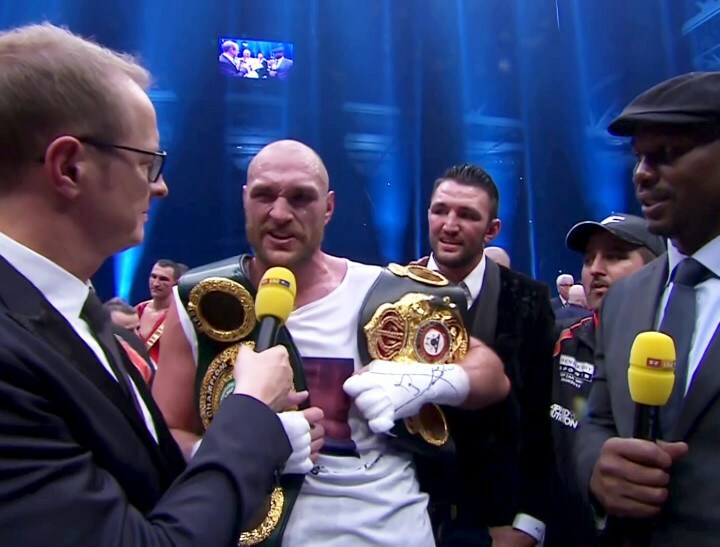 An avalanche of news stories – with some suggesting that Tyson Fury’s heavyweight career had been derailed by anything from mental health issues, to PED usage, and recreational drugs – has fallen on the heavyweight landscape over the last couple of months. The WBA and WBO recently stripped Tyson Fury of their titles, catching up with the IBF, who did the same in 2015 (unbelievably, just 7 weeks after Fury had won their title, the IBF crowned Charles Martin as their champion for beating Vyacheslav Glazkov). The WBC claim Deontay Wilder is the world champion. Joseph Parker is now in possession of the WBO belt. However, irrespective of what these sanctioning bodies attempt to have you believe, this fact remains: Fury is the man who defeated the internationally recognised heavyweight king, Wladimir Klitschko. As long as this victory is not overturned and changed to a “No Decision,” Tyson is unquestionably, “the man who beat the man.” A year of inactivity does not change that. Heavyweight history is filled with champions, including some of the most famous men to have ever laced up a pair of boxing gloves – who had long stretches in which they did not defend their championship. Tyson Fury is by no means the first. As long as Fury fights by April 2017, he still won’t crack this top 10. Here are the 10 longest, Lineal heavyweight title hold ups, since 1892. The 6’ 1” foot, 218lbs, bull-like, Jeffries, knocked out former champion, James Corbett, with a single left to the jaw, in May 1900 – it was a year and a half before he made another defence, his longest period of inactivity as champion. Although he averaged only one or two defences a year throughout his 6 year, 1899 – 1905, title reign, the “Boilermaker” fought over 100 exhibitions during this timeframe. In April 1995, 46 year old George Foreman won a bruising, controversial points decision over German, Axel Schulz. “Big” George declined the IBF’s mandate that a rematch should take place in Germany, so the organisation stripped him of their belt, but Foreman continued to be recognised as the Lineal champion, eventually making another defence 18 months later. Sales of the phenomenally popular “George Foreman Grill” were certainly boosted by the fact Foreman was the world champion, from 1994-1997. Johnson’s emphatic destruction of ex-champion, James Jeffries, on July 4 1910, sparked furious, fatal riots across the country. Disgusted with the ease with which Jack had crushed their hero, many cities banned footage of the fight from being shown in theatres. “White America” had failed to defeat Johnson inside of the ring, so instead, attempted to sabotage his reputation with repeated, distasteful stories about him in the press. Precisely 2 years later, Johnson defended his title again, and to the disappointment of many, he appeared just as sharp as ever, outclassing “Fireman” Jim Flynn in Las Vegas. “Ruby” made just one successful defence of his title in June 1897, and then waited 2 years before finally agreeing to a clash with the formidable James Jeffries – a fight he lost, getting KO’d in the 11th round. In a stunning upset the “Cinderella Man” outpointed heavyweight champion, Max Baer, in 1935. His first defence was due to be against Max Schmeling, but last minute concerns that if the German won, the Nazis would prevent American contenders from challenging for the title, resulted in the fight being cancelled. As an extra incentive to cancel the fight, Braddock was reportedly offered ten times as much money, for giving hot prospect, Joe Louis, the first crack at his title – this bout didn’t happen until 1937. Commitments to the US Army during World War 2 – which included boxing around 100 exhibitions to approximately 2 million soldiers – meant that a large portion of Louis’ reign in the 1940s was interrupted. 2 and a half years after winning his 1942 rematch with Abe Simon, Louis beat Johnny Davis in 1944, and then didn’t defend the title again for a further 15 months. Ali’s refusal to be drafted into the American army led to a government enforced absence from the ring. On February 3, 1970, he held a press conference, announcing his retirement, meaning 2 years and 10 months had elapsed since his 1967 victory over Zora Folley. The beginning of Muhammad’s championship reign was also slow. After rocking the boxing world with his stoppage victory over Sonny Liston in 1964, Ali’s hernia operation delayed their rematch, meaning there was 15 months between their two contests. Having made 5 successful defences of the title, Jack spent 3 years enjoying the fame and riches that came with being heavyweight champion. He bought a mansion in Hollywood, romanced actress, Estelle Williams, before splitting with his manager, and eventually losing to Gene Tunney in 1926. After one title defence in January 1894, Corbett utilised his position as world heavyweight champion to his advantage, with theatrical performances and numerous boxing exhibitions. He had a non-title bout in 1895, but did not put his championship on the line again until his 1897 duel with Bob Fitzsimmons. After dethroning Jack Johnson in 1915, “The Pottawatomie Giant” made one defence of the crown in 1916, and then for the next 3 years he capitalized on his celebrity status, starring in films, theatre shows, as well as taking part in a string of boxing exhibitions. He did not defend his title again, until his mauling at the hands of Jack Dempsey, on July 4 1919. Deontay Wilder, Joseph Parker, and Anthony Joshua have not tasted defeat as professionals. These three heavyweights may also hold versions of the world title, but it is hard to imagine they feel fully content being named “world champion” after beating relative professional novices, Bermane Stiverne, Andy Ruiz Jr. and Charles Martin – not when their rival, Fury, audaciously ventured to Germany and ended the 11 year unbeaten streak of the vastly experienced, unified champion, Wladimir Klitschko, to become the Lineal champion. Over the last 120 years, the Lineal heavyweight champion has almost always been regarded as “the man to beat.” If Joe Louis was fighting in today’s division, you can be sure he would not have wanted anyone calling him champion until he’d “whipped” Tyson Fury.